I hope you can take a few minutes that will spare you some extreme pain! Please read! I have just lived an extremely difficult and very painful 9 days of my life. 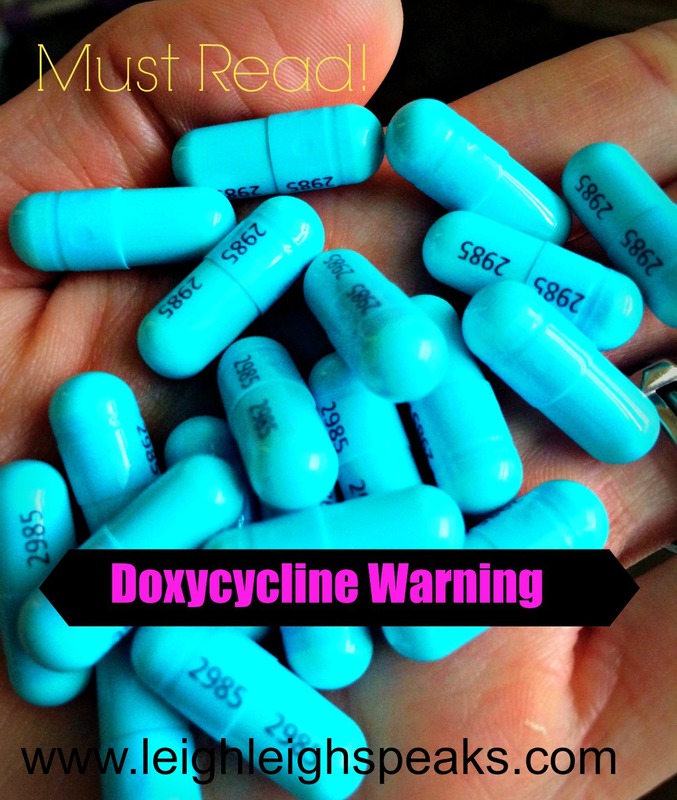 I wanted to use my blog to share some valuable information to those of you who are taking Doxycycline Hyclate 100MG. Months leading into turning 30 have been hectic on my body. I have gone through more hormone changes then I’d like to mention on here, but the biggest bummer so far has been dealing with acne on my face. My dermatologist put me on Doxycycline Hyclate about a month ago, along with a topical cream. I have been taking the medication as prescribed with minimal complications. Every now and then I would notice a little heartburn, but it never lasted long at all. Last Thursday night I was about to hop in bed when I remembered I forgot to take my second pill for the day. I usually take my second dose with dinner, but on this night we had a track meet to catch, plus squeezed a work out in, so dinner was served later then usual! I was beat from the busy week so no time to stay up, after I ate it was time for bed! I took a drink of water beside my bed, swallowed the pill, and laid down. I quickly jumped up remembering that I was suppose to, as instructed, wait “ten minuets” before laying down. This was in the medication pamphlet, not on the bottle just FYI. That night I woke up with a lump and a pain in my throat. I figured the pill didn’t go all the way down, so I traveled to the kitchen, grabbed an oatmeal pie, and drank some orange juice. Not very healthy I know for a midnight snack, but I was hoping the thickness of the oatmeal pie would push the pill down. It still felt weird, but I continued to fall back to sleep. The next morning I woke up with heartburn which lingered all day and made it difficult to eat my lunch and dinner, but I managed to get it down. My husband suggested maybe I had just scratched my throat on the BBQ the previous night. By Saturday night as I tried to eat my delicious hamburger my brother in law prepared for us, it had felt like the bottom of my throat where my esophagus is located, was swollen. I could feel my chewed up bites barely getting down. On Sunday I was barely getting mash potatoes down, and Sunday night, I felt horrible! Sunday night is when I got a clue something wasn’t right and really concentrated on trying to go on a liquid diet. The pain to swallow was so severe that I was not even able to swallow water without extreme discomfort. I never ran a fever, just another FYI. I had to sip the water in small swallows or I felt like my esophagus was going to burst. You know how it is when you are a wife and mom of four, the world doesn’t stop moving while you are not feeling well. I continued to go to work and do all my mom and wife duties, but by Tuesday the pain had traveled to my stomach and now I was experiencing burning and this heaviness sensation on my chest, like someone was sitting on top of me. The pain was so strong that it radiated to my upper back. It felt like someone was stabbing me in the chest. The pain never went away! I couldn’t escape it no matter what I did because I was limited to what I could put into my stomach. I was even sleeping propped up. The pain would wake me on and off during the night time. It was out of control, so I finally made a call to see my doctor. He told me to stop the medication at once. I contacted my dermatologist to let him know what had happened. My doctor diagnosed me with esophagitis and gastritis, which is inflammation of the tissue in your esophagus and stomach. He wanted me to continue a liquid/soft diet until I was doing better. He also prescribed two medications to help stop the acid in my stomach so that I could start healing. I was instructed to contact a GI doctor if my extreme pain continued still on Monday. It’s Sunday night, and I am happy to report the medications, and prayers from my family and friends, have done wonders! I was able to eat a soft ham egg croissant last night (happy dance). I can now finally chug liquids without pain. I can tell that I am not 100% yet, as I can still feel a tiny little pain in my esophagus, but I know I will continue to recover as I am able to get some calories and larger quantities of liquids in my system! Please don’t make the mistake that I made while taking this medication. I would recommend not laying down for an hour after you take Doxy! The doctor did say this was a result of the medication getting stuck in my throat, and then dissolving into the esophagus and stomach tissue. To help minimize the pain, I did ask my doctor for Tylenol with codeine. I didn’t get this until Friday, I wish I could have received it sooner, as it worked wonders on the pain! I hope this information spares someone out there a whole lot of excruciating pain! Let’s talk! Have you taken this medication with any complications? Has this happened to you!? Be sure to follow my blog via wordpress/ email subscription, or connect with me on Facebook or Twitter so you don’t mess out on future blog posts! Ahh I used to work in a derm office and I have heard of this! 😦 Doxy is crazy hard on your stomach, I can’t even imagine what it felt like in your throat! Yikes! I am glad you are alright! Thank you! It was awful!! I hope the doctors really express the dangers of this medication! You know, where I worked, they did not prescribe doxy much, but when they did, they definitely did stress the dangers. I hope other offices do as well! Oh wow, Ashleigh! Thanks for sharing! This is important information to have. I know at least one friend who has taken this medication. Also, doctor’s don’t always give this important info. Thank you, & I’m so glad you are better!!! May I ask which topical medication you are taking or were taking? I’m on AcZone…just wondering if you had any side effects with it. Love you!!! Hi Sally!! Thanks for writing! I am currently taking Proactive plus.. Three step system.. But on the step two I mix it with my maleluca essential oil from Doterra… Which I can get to you at whole sale. I also use a spin brush when I wash my face. I have been on it since Halloween and I finally started notice a difference when I bought a spin brush and added the oil to step two! My skin is far from perfect and I still get break outs, but not as bad! I’m sticking with it for now! this is what I’m going through right now think God for this post! I was literally in a panic thinking I should go to the ER!!! You should definitely go see your doctor to get some medication to help heal the damage! Praying you heal quickly! It is a very strong medication! I finally beat my acne and I think it is because when I stopped eating whey protein bars and whey protein shakes and cut gluten my face cleared up. Have your tried changing your diet? Same thing just happened to me. It’s the worst pain imaginable. How long did it take you to heal? I believe it took a good two weeks! I’m so sorry, prayers for relief! I’m 3 days in on what is the most incredible pain I have ever felt in my chest. I did the same thing with the Doxy – Bevore bed, hardly any water, sleep. I’m in horrific pain, I feel like a dragon. Pain when eating, drinking, breathing… put a call into my G.I. Thank God for this post, I have been so concerned. Afraid it’s ulcerated… hoping I don’t need a scope. I’m ready to feel like myself again asap! I’m so sorry Haylee, prayers you recover quickly! experiencing that today unfortunately my doctors/pharmacy/dermatology are not the best (i was experiencing side effects including headaches and blurred vision last month, and they were all so unknowing of it all and uncaring). i went off it for a couple of days and then went back on it and the bulk of those side effects went away. then last night i fell asleep right after taking it and woke to the same deal and still suffering from it the now. i phoned pharmacy after seeing this post but she was the least help and told me to take the meds after my dinner i had to further ask for help with the damage i have caused now which she has just said to keep taking rennies…might wait a day then phone GP if this hasnt gone. Oh no!! I stopped taking the meds and never took them again. It’s super painful! I had to spend like $100 for a liquid that coated throat and then some other med, maybe I listed it in my post, it’s been a while so I can’t remember exactly. I would go see your regular doctor for sure! Praying for you! This just happened to me. Mother’s Day evening I was on day 3 of this medicine and I was at my sister’s house – so I quickly took the medicine before bed and laid down. I immediately felt heart burn and just assumed the pill didn’t desolve properly… fast forward to Tuesday I went to Cvs and the pharmacist recommended an over the counter type Prilosec – I called my dr and they said I could stop taking the doxy. I stoped taking it Wednesday and still am in pain Saturday night. The drs office said to call Monday if I’m not better by then. This post made me feel so much better. Thank you so much for posting. Your welcome! I hope and pray you recover quickly!!! This medicine is no joke! I wish the doctors/pharmacist would do a better job warning patients of the immense pain / damage this pill could cause if taking before bed time! Feel a bit better reading this, this is exactly what I’m going through at the moment! took doxy last night before bed with no water and now it feels like I ate way too fast and the food is stuck in my throat! Eating and drinking kills, but I’m wondering will it resolve itself over time or should I go to the Dr? I had to go to the doctor for meds because it became so painful! Praying you heal quickly! I’m literally having the same issue right now, I took a tablet on Monday night and it’s been stuck in my throat since and I’ve tried all sorts to make it go down but nothing will: what do I do? It probably went down but did some damage where it got stuck. I would go see your doctor. Thanks so much for posting. I was taking this tablet and as great as it was for my rosacea, I think it was the cause of me feeling really exhausted all the time. I did stop but faced flared up again so someone suggested taking it before bed. Stupidly, I had not read the leaflet or if I did it was so long ago that I had forgotten. It had been ok but last night I woke feeling like it was stuck in my throat and got up and drank lots of water. This morning it felt like it still hadn’t gone down so I ate but it still felt the same. I don’t feel any pain really just a bit of discomfort but just wondered if anyone was like that and it got worse (in which case, I will book an appointment with my gp to get tablets) or if I am just lucky that it is not as bad. Thanks for quick reply. Think I will be booking that appointment then. Fingers crossed. I didn’t lay down after taking my Doxy. I don’t think I drink enough fluid to get it all the way down. #2 no no. Drink enough (no milk products) fluids to ensure the pill/ capsule gets in the stomach. Thanks for bringing this to our attention. Hi Ash’Leigh. Thank you so much for posting this. I too am on doxy for my acne. I have been bad at remembering to take it in the daytime so I took a the doxy last night and did not leave enough time before going to bed. Now I have woken up at 4 in the morning with intense chest and throat pain. It feels like it’s tightening, swelling and burning all at the same time. My boyfriend just ran to Walmart (only place open 24hrs) to get me antacids. Do you think this is a good temporary relief before I see a doctor? Thanks again for your time in helping all of us others by posting your situation. I hope! Mine seemed to get worse so get to the doctor soon! Lifting you up In prayer right now for quick healing and relief in Jesus name! I have been taking this pill for about 6 days now and had no problems with it so far but my doctor told me to drink lots of water before and after taking it and to stand for AT LEAST 10 minutes after taking it and to not take it with any food. It seems like Doxycycline is a dangerous pill to take. I’ve been taking it for 12 days now and I forgot to mention that there is a liquid form to it. For some reason, the first few days I started taking it I had no problems swallowing it but now I think my anxiety has come in and it completely shut down my throat not allowing me to take it so now I have to have it sit in my mouth for 4-5 minutes until it is mushy enough and I am afraid it will dissolve while it is going down my throat and possibly get some of it stuck in my esophagus and get what you got because it really doesn’t seem very pleasant and fun to deal with. Do you think it will ever get partially stuck in my esophagus? Awe I’m sorry about the anxiety! No fun! I think you will be fine, the reason it gets stuck is because you lay down and it doesn’t travel all the way to where it is going. If you are not taking it around bed time, I wouldn’t think it would get stuck. Thx, you’re a really supportive person! I take it at around 3:40 pm since it’s 2 hours after my lunch and 2 more hours before I eat dinner. I have to take Doxy until December 21 which is so far away☹️. You should be okay! Just try not to think about it and relax do your body relaxes! I will have to share maybe an edit to this post my current skin care routine. It looks the healthiest it has looked in years! I only need to take this for 2 more days!!! Apparently you have to stand for a minimum of 10 minutes and not lie down for about an hour. I am so surprised I got through this because of my trouble swallowing it. It also hurts your esophagus when it goes down so that is why you have to drink so much water. Thank you so much for your support! It hopefully did treat it but I haven’t had the check up appointment yet. Thank you so much for your support and have a Merry Christmas 😁!